Rob Davis, director of the Center for Pollinators in Energy at Fresh Energy explores the many opportunities for development of solar sites that are pollinator-friendly. The article originally appeared in the Vol 76, No. 3 issue of ABF Quarterly, the official publication of the American Beekeeping Federation. Download the PDF to view the story as it appeared in the publication. John Jacob of Old Sol Apiaries in Oregon’s Rogue Valley arranged his newest bee yard among millions of emerging flowers and native grasses. Glancing over his shoulder, he knew the site wouldn’t be sprayed with insecticides—his yard is adjacent to millions of dollars’ worth of space-age technology suspended a few feet off the ground. While John worked, ground-mounted solar panels were silently converting light from Earth’s “old Sol” directly into electricity for nearby schools, businesses and residents, as well as generating revenue that pays ecologists to manage the flowering Yarrow, Blue-eyed Mary, Oregon Sunshine, Rose Checkermallow and other ground cover throughout the site. Across the country, University of Maryland biologist Dr. Kirsten Traynor established a similar apiary last year after National Geographic decided to power its headquarters and museum with 50 percent solar energy. Dr. Traynor was contacted by one of the solar engineers who is also a beekeeper and was familiar with her research. Jacob and Dr. Traynor are joined by beekeepers in Vermont, Wisconsin, Illinois, Minnesota, Texas, New York and Iowa pioneering an American path inspired by British epers who started placing apiaries on solar farms years ago. “Solar farm honey might be our favorite thing ever,” read the headline of a UK-based article from 2014. Indeed, driven by plummeting costs and growing demand, tens of thousands of acres of solar sites are blooming across the country. Churches, school districts, manufacturers and data center operators are saving hundreds to thousands of dollars every year by getting a percentage of their energy from the sun. And much like personal computers, the cost of solar panels—an American invention to power space-race satellites—have fallen by more than 99 percent since 1960. Solar is so cheap now that in many places it’s cheaper to build a new large-scale solar array, than to continue to pay for fuel and maintenance costs on aging smokestack power plants. And farmers are actively pursuing this new cash crop as well. When farmers lease their land for a large-scale solar array, they can lock in revenue of $500-1500 per acre for the duration of the lease, giving them a buffer against fluctuating commodity prices and the opportunity to grow pollination- dependent crops nearby. The catch? The land has to be fairly flat and within a mile or two of a substation. Because the U.S. solar industry first took off in the desert Southwest, standard practices for the land on solar sites have included bare ground, gravel and shallow-rooted lawn grass. These “solar-centric” designs prioritize the solar configuration and give comparatively little consideration to land stewardship and other agricultural factors. At the same time solar was taking off in the Southwest, solar was also growing rapidly in England and Germany, though with radically different engineering, design and management principles. With equal priority given to agricultural functions and enhancing biodiversity, solar sites with low-growing meadows under and around the panels became a common practice. In these situations, the solar company leases the land, then the solar hardware and flowering habitat is established and managed at their cost for the life of the project. Data shows that pollinator-friendly solar arrays don’t just reduce operations and management costs (frequent mowing and mowers damaging solar panels is expensive), but also result in increased abundance of bees and other insects. The nonprofit organization I work for, Fresh Energy, has been in regular contact since 2015 with leading practitioners of pollinator-friendly solar in the United Kingdom, actively importing, adapting and sharing best practices and lessons learned. Moving into 2018 we expanded this work and created the Center for Pollinators in Energy (www.Fresh-Energy.org/BeesLoveSolar), a national clearinghouse and catalyzer of pollinator-friendly solar information, standards, best practices and state-based initiatives. 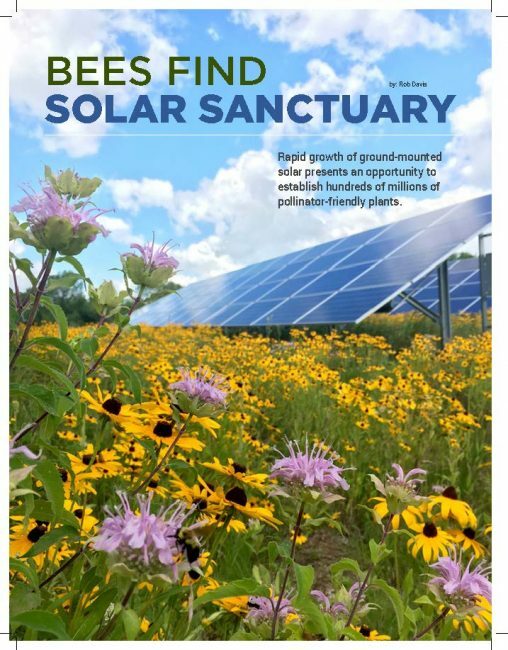 Pollinator-friendly solar and the work of the Center for Pollinators in Energy have been highlighted by the U.S. Department of Energy and the U.S. Department of Interior’s National Conservation Training Center and featured in Scientific American, National Geographic, Modern Farmer and other media. We are actively working to make pollinator-friendly a standard development practice for ground-mounted solar arrays. Our research and deep expertise in this area have revealed two key (while light-hearted) insights: 1.) people aren’t well suited to pollinate crops, and 2.) bees aren’t very good at public policy. Photographers visiting the pear and apple orchards of southwest China have documented the staggering effect of over- use of insecticides. Farmers in the area lash chicken feathers to bamboo rods and use these makeshift tools to pollinate each individual flower—a practice that would be impossibly costly for large-scale agricultural production in the United States. To produce a single market-ready blueberry requires a pollinator to visit a flower 2-4 times. Each raspberry, 5-6 visits. Each strawberry 20-60 visits. These crops, and others, produce hundreds of billions of individual flowers, each opening at around the same time, and require trillions and trillions of visits by pollinators. Honey bees, bumblebees and other native bees are well suited for this work. Another example is from 2016 when Fresh Energy, Audubon Minnesota, Minnesota Corn Growers and Minnesota Farmers Union worked with agricultural and business leaders to establish the nation’s first statewide standard for the vegetation that grows under and around large ground- mounted solar sites. With bipartisan lead authors, the “Pollinator-Friendly Solar Act” passed unanimously as part of the 2016 Agriculture Omnibus bill. In the two years since, Fresh Energy has worked across the aisle to pass similar legislation in New York, Maryland, Vermont and Illinois. Dr. Marla Spivak at the University of Minnesota and Dr. Adam Dolezal, now working with Dr. May Berembaum at the University of Illinois, see solar sites as perfect healthy refuge sites for honey bees. Dr. Spivak notes that honey bees will benefit from the nutritional floral pollen—particularly their immune systems and detoxification systems—and this is backed by Dr. Dolezal’s research. Unless there’s an alfalfa or clover field adjacent to the solar array, these may not be top-producing honey hives, but the habitat will contribute to healthy bees. Of course, any new land use ultimately needs a building permit from local authorities. Some people prefer things just the way they are, and a large number of solar arrays still feature a “solar-centric” design. Though repeated home valuation and sales data shows that there are just as many people who want to live near a solar array (i.e., a quiet neighbor) as who don’t, it is good that people are attending these county- level planning meetings to learn more and get involved. Because images of solar-centric sites are so common in the media, people are sometimes mistaken in thinking that using some farmland for solar threatens our food supply. But beekeepers and other conservation advocates have consistently highlighted the grave food system risk from lack of available healthy forage for pollinators. Acres enrolled in the Conservation Reserve Program have been slashed from 36.8 million in 2007 to just 24 million acres for 2017/18. And a recent report by America’s Farmland Trust specifically highlighted how low-density residential development (houses on one- to 20-acre parcels) replaced 12.7 million acres of farmland from 1992 to 2012. “The pattern of low-density residential development expanding well beyond the suburbs represents an additional, insidious threat to the nation’s agricultural land,” read the report. Altogether, solar projects could provide a world of good for pollinators—and seed and landscape business including Minnesota-based Prairie Restorations, Pennsylvania-based Ernst Conservation Seeds and Oregon-based Lomakatsi have noticed as well. The United States has more than 280 million acres of row crops and just a tiny fraction will be used for solar sites, but these sites can provide a badly needed and long-lasting service in providing healthy food to the hardworking commercial and native bees that pollinate our crops. Could Pollinator-Friendly Become the Norm? Back in 2014, Connexus Energy, a member-owned electric cooperative, built the largest co-op solar array in Minnesota—a 245-kilowatt system on 1.2 acres adjacent to its headquarters. The site was designed with gravel, but an experienced staff person made the case that a meadow of grasses and flowers was more in line with the organization’s values. Now, Connexus is annually celebrating National Pollinator Week and providing customized jars of honey from the solar array to its members and community partners while also planning for several much larger pollinator-friendly solar projects. OneEnergy Renewables, a socially conscious B-Corporation and developer of solar projects nationwide, is using pollinator-friendly seed mixes for a number of its projects currently under development. “It’s a great opportunity for the solar industry as a whole, and we’re excited that our projects will provide so many benefits to the communities in which they’re located,” said project manager Gia Clark. Another national solar developer, Cypress Creek Renewables, hired one of the nation’s first graduate students to write her master’s thesis on pollinator- friendly solar and recently pledged that all its New York state projects will meet a pollinator-friendly solar standard. Other solar developers, including US Solar and IPS Solar, have pollinator-friendly solar arrays in Minnesota and Illinois. One of the most experienced firms in this approach, Eden Renewables, recently crossed the pond from England to New York, where it is developing several projects. Something is abundantly clear—interest in solar from farmers and demand from hospitals, cities and towns is all increasing. More solar is coming, and from what I’ve seen firsthand, when beekeepers show up to strongly support a proposed pollinator-friendly solar array, it’s going to be built and planted. The fastest way to change many industries, and solar is no exception, is to highlight and reward the companies that are doing it right. Competition is a powerful motivator.